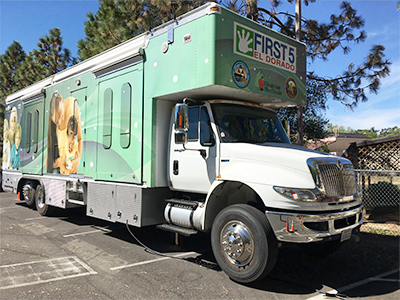 El Dorado County is celebrating the arrival of the El Dorado Smiles Dental Van to local schools. The dental van will provide comprehensive dental care at school sites, with a primary focus on children ages zero through 18. The dental van will be operated by the El Dorado Community Health Centers as part of their recently expanded dental health services, and is supported collaboratively by El Dorado County schools, First 5 El Dorado Children and Families Commission, El Dorado County Office of Education and the El Dorado County Health and Human Services Agency. El Dorado Smiles Dental Van will travel to various school sites in El Dorado County throughout the year on a pre-determined schedule. Services offered will include cleanings, fluoride treatments, sealants, x-rays and complete oral exams. Medi-Cal and private dental insurance will be accepted. The dental van services will be provided to the children by appointment on the school site. Parents will be asked to complete a health history and consent form prior to setting up an appointment for the child to receive services. Those without insurance can contact the Health and Human Services Agency to find out options for insurance.